Davies Ranger Chicken & Rice is a highly palatable, hypo-allergenic, gluten free dog food which is based around high quality chicken which provides essential amino acids that every dog requires. Formulated for adult dogs with normal activity levels, the rice and maize contained provide a highly digestible carbohydrate balance that also contributes to the taste of this gravy basted food. Cereals (min 4% rice), meat and animal derivatives (min 4% chicken), oils and fats, derivatives of vegetable origin, fish and fish derivatives, seeds, minerals and yeast. With antioxidant: BHA/ BHT. Protein 22%, Oil 12%, Fibre 3%, Ash 8%, Vitamin A 10,000 IU/kg, Vitamin D3 1,500 IU/kg, Vitamin E 150 mg/kg. Copper (as cupric sulphate) 15 mg/kg. 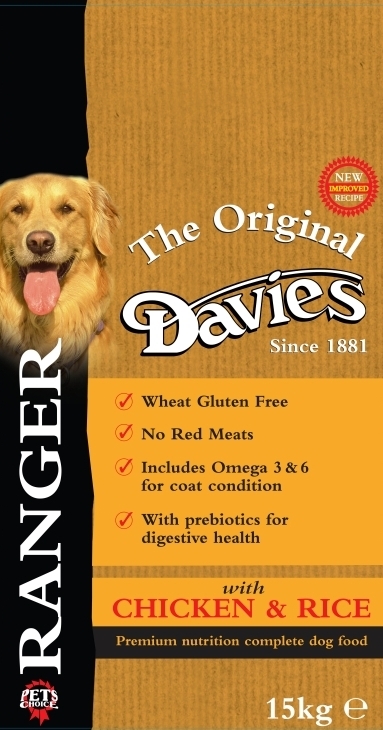 There are currently no questions for Davies Ranger Chicken & Rice Dog Food - be the first to ask one!